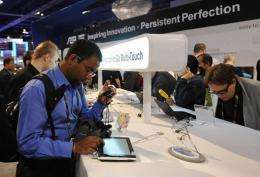 Attendees test new tablet and notebook computers at the 2010 International Consumer Electronics Show on January 8, in Las Vegas. Industry tracker Deloitte predicts the tablet computer market will boom this year with tens of millions of people deciding the notepad-sized devices are "just right" for their needs. Industry tracker Deloitte predicts the tablet computer market will boom this year with tens of millions of people deciding the notepad-sized devices are "just right" for their needs. "This Goldilocks of devices -- not too big, not too small -- is expected to offer an appealing balance of form and function going forward," the market analysis firm said, referring to the well-known children's story. Tablet computers "may turn out to be 'just right' for many users in 2010," Deloitte said. The forecast bodes well for iPhone, iPod and Macintosh computer maker Apple, which is hosting a January 27 event here to unveil its "latest creation," which is hotly rumored to be a tablet computer resembling an oversized iPod Touch. The Cupertino, California-based company did not supply any further details about the invitation-only event to be held at 10:00 am Pacific time (1800 GMT) at the Yerba Buena Center for the Arts Theater in San Francisco. According to various reports, Apple is poised to launch a color multimedia device that allows users to browse the Web, listen to music, watch movies or television shows and also serve as an electronic book and newspaper reader. Publishing powerhouse HarperCollins was reported to be in talks with Apple regarding providing digital literature for reading on a tablet device. Apple's tablet is expected to have a 10- to 11-inch (25.4- to 27.9-centimeter) screen, slightly larger than typical devices on the market. "With a new form factor and significant processing capacity, connected portable devices will likely be purchased by tens of millions of people in 2010," Deloitte predicted. "Called Net tablets, or netTabs, these devices have an advantage over smartphones -- which are small for watching videos or Web browsing -- and notebooks, netbooks, and ultra-thin PCs, which are too heavy, or expensive." Improvements in graphics, processing power, and wireless broadband Internet availability are making tablets more attractive, according to analysts. A trend toward applications offered online as services such as Web-based email, video sharing, or spreadsheets add to the appeal of lightweight devices that serve as gateways to computing power hosted on the Internet. "2010 is likely to see a proliferation of netTabs," Deloitte said, which noted that the devices will likely be a threat to tablets limited to single functions such as reading digital books. Apple event set for Jan. 27: Will tablet be announced? With CES over, can tablet PCs live up to all the hype? I for one do not want one of these devices. The thought of my data being away somewhere on some cloud does not bode well with me. I want my data, applications and physical devices local. If Google goes down (unlikely), then I loose connectivity to my cloud. What's going to happen when someone is running a database or data intensive task on one of these clouds. For commercial data transfer and even supercomputer timesharing, this might work. For end consumers, I fear the worst. The trend toward cloud computing seems to have something in common with the move of citizens info in the ~1920/30 U.S. (country I'm from/know any history about). Many people felt unsure of having their lives recorded by the govt but the losses in independence have allowed for incredible gains elsewhere, namely technology. Seems to me that using the cloud has obvious dangers but the benefits are such that the only two options will soon appear to be adopt the tech or become Luddite. But the choice should CERTAINLY not be forced. followed by next generation of interface choices. Will netTabs have usb ports for saving data, worst that can happen is increased responsibility to users to adapt to new tech and probably more important and likely, to alter new tech to adapt to user uses, preferences and even so just more transition in rapid acceleration.